Unlike Thrift, avro serialized objects do not hold any schema. As there is no schema stored in the serialized byte array, one has to provide the schema with which it was written. Confluent Schema Registry provides a service to maintain schema versions. Confluent provides Cached Schema Client, which checks in cache first before sending the request over the network. Json Schema present in “avsc” file is different from the schema present in Avro Object. During Serialization : based on schema of the Avro Object a schema Id is requested from the Confluent Schema Registry. The schemaId which is a INTEGER is converted to Bytes and prepend to serialized AvroObject. 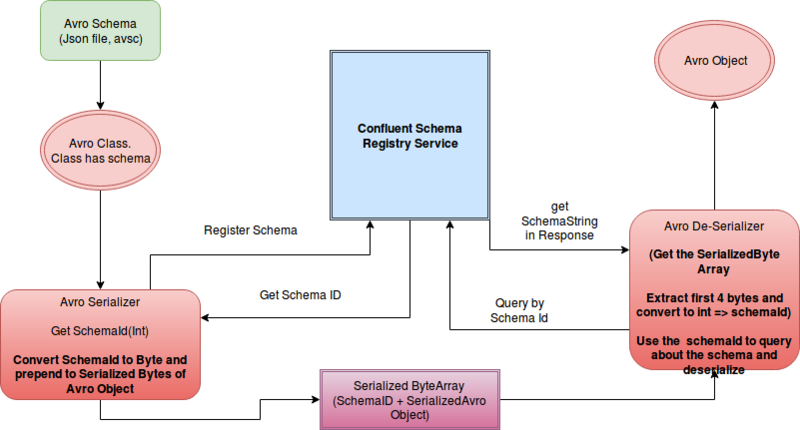 Schema is requested from the Confluent Schema Registry and using this schema the byteArray is deserialized. Employee employeeNew = (Employee) serde.